The Nuage collection is a stylish new design and clever nomade lighting. Its lightness and its adap- tability make it the bestseller of the Designheure’s collections. Simpli- city and pure lines for this timeless collection. 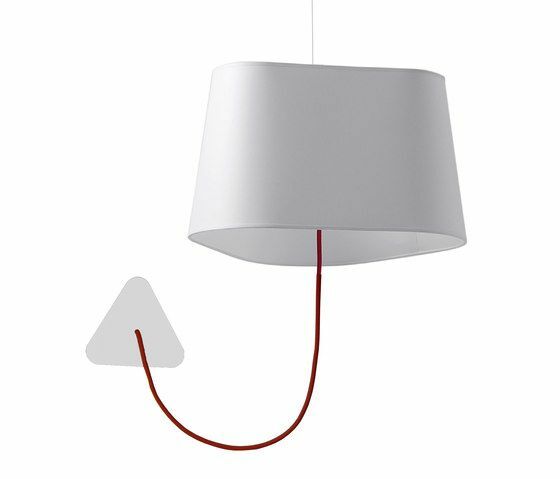 The triangular shade produces a very particular light, cutting the space in architecture. His elegant line related to the prow of a ship is enhanced by the textile cord. The custom made offer of this collection enable to create very unique projects. Material: Calico fabric or lacquered, lacquered ￼￼steel, colored textile cord. Color: White diffusing - Red cord White diffusing, black border - Black cord White lacquered/silver interior - Red cord Black lacquered/blue interior - Blue cord Black lacquered/yellow interior - Yellow cord Yellow/gold interior - Black cord Custom made colors upon request.